The following appeared in the June 27th 1955 issue of LIFE Magazine. This is how the worst racing accident happened. Path of Mercedes is shown above as reconstructed at the official inquest. After striking barrier the car somersaulted for about 85 yards, spewing flaming parts into crowd behind the fence. Lavegh was thrown out and his skull crushed. 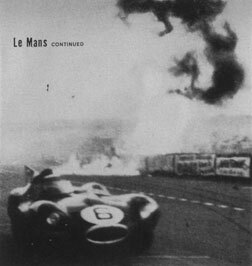 Hours after flame and flying metal erupted, few of the spectators at Le Mans, France knew what had happened. 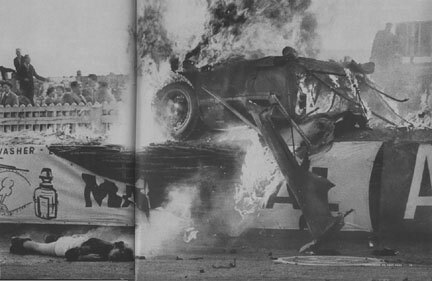 It was days before drivers' stories and these pictures could reconstruct the worst accident in racing history. Some 250,000 spectators had gathered for Europe's classic sports car race, the 24-hour test around an 8.38-mile course. Concerned about a course laid out years ago for slower cars, Mercedes Driver Pierre Levegh complained, "We need a signal system. Our cars go too fast." As the race entered its third hour the cars were breaking records at every lap when Jaguar Driver Mike Hawthorn received a signal from his pit crew to stop for gas. As he braked, an Austin-Healey swerved to avoid him. A few lengths behind, Levegh raised his hand, signaling another Mercedes to slow up. At 150 mph he had no chance to do so himself. Hitting the Healey, the Mercedes took off like a rocket, struck the embankment beside the track, hurtled end over end and then disintegrated over the crowd. The hood decapitated tightly jammed spectators like a guillotine. The engine and front axle cut a swath like an artillery barrage. And the car's magnesium body burst into flames like a torch, burning others to death. 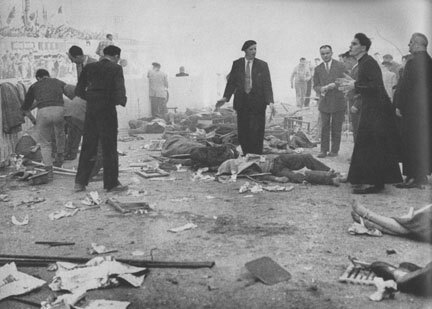 In a few searing seconds 82 people were dead and 76 were maimed. Hawthorn, though unnerved, went on to win and set a new record. But few spectators had the enthusiasm to cheer. 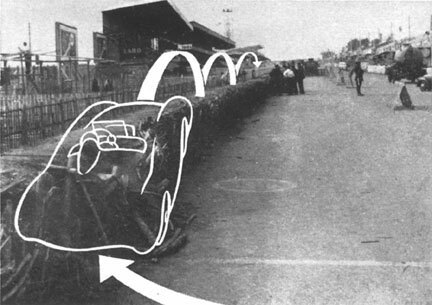 Still blazing fiercely, minutes after the crash, body of the Mercedes rests atop wall near a spectator it killed. Made of magnesium, it burst into flames as fuel ignited it, showered area with white-hot sparks. Race goes on and Hawthorns Jaguar, after refueling passes flaming wreck. The other Mercedes withdrew from the race, but the remaining cars continued. 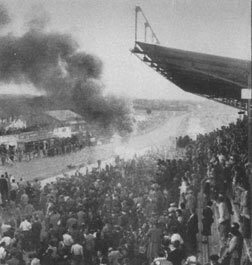 From the grandstands spectators could see burning Mercedes. Fragments landed in section left of CIBIE sign. Across track are pits the Healey hit. Two sorrowful priests, two hours after the crash, walk among the dead, to whom they had administered last rites. The following day a memorial sevice was held in the ancient cathedral of Le Mans. The French goverment now has declared a ban on sports car racing until track conditions and rules are improved.